Day 1: Mrs. Romero has 14 balloons and wants to share them equally with 7 friends. How many balloons does each friend get? The Doorbell Rang, by Pat Hutchins, introduces the lesson and provides the context for teaching students to connect division notation with problem situations. 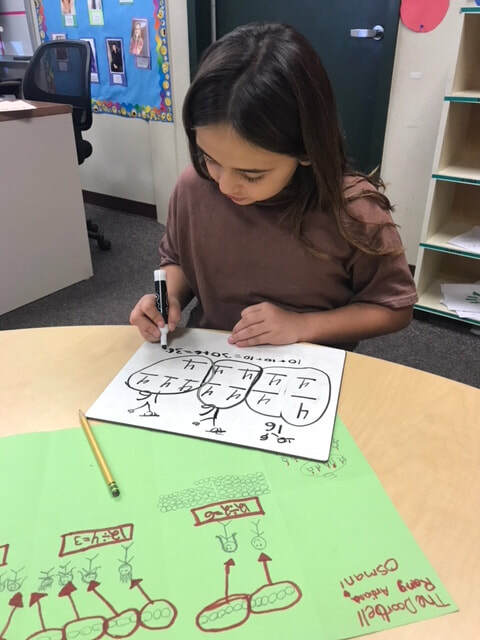 The lesson also helps children learn about remainders and how to record them and see how division and fractions are connected. After hearing the story, students retell it with division sentences and draw pictures to show their understanding of the notation. Also, each child invents a sharing problem and writes a one-even sequel to the story. Interpret, model, and solve division situations. Notice a relationship between multiplication and division. After students represent and write equations for each sharing situation in the story, the will have 3 boxes left on their paper to make 3 more sharing cookie situations. See extension on page 34 of the lesson for another challenge. Day 1: Look at their papers for accurate drawings, representations of the sharing, and equations. Day 2: Exit Slip - What did you learn about division in the cookie sharing activity? The book Everybody Wins!, by Sheila Bruce, provides the context for this lesson. Friends in the story figure how to share pizzas, baseball tickets, bubble gum, and more. Students solve and discuss eleven real-world division problems and learn ho to represent each division situation mathematically. Students then figure out all the ways to share twelve items so there are no leftovers. The lesson gives students experience with the sharing or partitioning model of division. Stop on page 7: What is the math situation? How many frozen pizzas will they each get? How do you know? Stop on page 10: What is the math situation? How many bags of marshmallows will each kid get? How do you know? Stop on page 15, etc. You don't have to read the whole book - maybe spread it across a couple days. Interpret, model, and solve fair share situations. Explore how to find all the ways a given number of items can be shared fairly with a given number of people. Exit Slip- There are 20 slices of pizza and four friends. How many slices of pizza will each friend get? Choose the number 18 and have the students make sense of the different ways to divide it. Ex:18/2=9, 18/3=6. Looking numbers without a remainder. This game of chance gives children experience using the sharing model of division to divide quantities of color tiles into equal groups and think about remainders. Starting with fifteen tiles, the children play in pairs and take turns rolling a die sharing the tiles among many groups and keeping the tiles that are left over. They record a division equation for each roll. children extend the game by creating their own dice and choosing how many tiles they wish to start with. Comments, Student Work Samples, Photos, Videos . . .
Students explicitly explore the relationship between multiplication and division. Relate division to multiplication with an unknown factor. Identify patterns in 2s count-bys and multiplications and relate multiplication and division. Build fluency with 2s and 5s multiplications and divisions. Explore patterns in 10s count-bys, multiplications, and divisions and represent and solve problems involving multiplication and division with 10. Identify patterns in 9s multiplications and divisions and learn a strategy for quickly multiplying and dividing with 9s.